HS2 Ltd have published partial details of 120 amendments to the HS2 plans to be debated on in Parliament on Tuesday, following complaints for MPs and members of the public. Next Tuesday (23rd June) approximately 120 amendments to the HS2 Hybrid Bill are due to be debated and voted on in the House of Commons. However, the plan had been that not even the MPs who will be asked to vote on the amendments on Tuesday would actually have seen them at that point. Furthermore, staff in Mrs Gillans office confirmed that the only documents available to MPs in the House of Commons at the time were a briefing produced by House of Commons staff which simply lists the parishes and boroughs where changes will take place, and a press release from the Department for Transport, which mainly focussed on claiming HS2 is ‘on track’, despite the original timetable stating the bill was meant to have become law before the General Election. In addition Mrs Gillans query, the Stop HS2 campaign understands that the HS2 Hybrid Bill Committee who are currently scrutinising the plans, were not impressed that people affected by the changes would not be able to give feedback to their MPs about them before the debate on Tuesday. 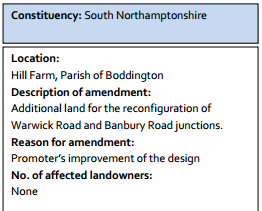 Following this pressure from parliamentarians, HS2 Ltd last night (Thursday 18th) published some explanatory information, which provides minimal details on the changes, which will include taking land from 69 new landowners as well as more land from ones previously impacted. The competence of HS2 Ltd has to be questioned by their claim that 18 of the changes to the design which include taking new land, diverting or adding highways and extending a viaduct do not affect any landowners at all. However, this additional information does not represent detailed information. 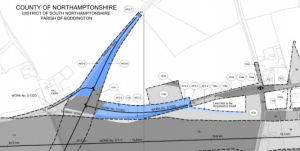 Notably in the Lichfield area, where the most significant change involves tunnelling under the A38 instead of going over it, there is no indication of what the height of the line would be. Check that your MP is not diverting their attention to the Referendum of EU and other side shows. DFT is failing with the Government on everyday travle on the motorways, urban roads rail and the Highly Suspect 2 you HS2. Some of the current MPs on Labour, Liberla and Conservatives have forgotten their mistaken judgements on the Select Committees and in the House of Commons vote and now are diverting your attention from their mistaken voting or support for diminishing expenditure on essential travel changes needed and HS2. Bring the MPs back to the real agenda the further decline of current transport and travel conditions please. Two wrongs do not make a right. The Parliament is in a dreadful state and PMs and MPs have only themselves to blame. Blame them and shame them into the disregard they have for your community and the nations Mother of all Parliaments. MPs simply in the job for themselves not for this nation and your well being. Chancer methods galor and Prime megamistakes. The UK is finally getting to message MPs mess up most of the time and leaders have not cared for the infrastructure and buildings as was needed. The Network Rail rail routes require more investment and London Underground routes require signficant addtional capacity beyond Crossrail 1. Bogus management of pretence is seen clearly now.